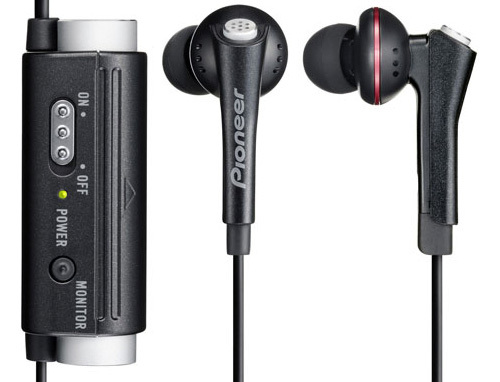 Pioneer SE-NC31C-K Noise Cancelling Earbuds | OhGizmo! By Andrew Liszewski on 03/30/11 • Leave a comment! Earbud style headphones already do a pretty good job at blocking out most ambient sounds and noises while you listen to music, but they’re not perfect. Neither are Pioneer’s new SE-NC31C-K earbuds, but thanks to built-in noise cancelling technology they manage to filter out about 90% of unwanted sounds, which could mean the difference between enduring crying babies for hours or catching a few Z’s on a long flight. The earbuds feature some surprisingly hefty 14.3mm drivers which should deliver impressive bass performance, and the inline sound processing unit is powered by a single AAA battery which is promised to provide up to 120 hours of peace and quiet. Available now for a reasonable $99 given the extra noise cancelling functionality.